Speech communication technology is a key factor in human-machine interaction, digital hearing aids, mobile telephony, and automatic speech/speaker recognition. With the proliferation of these applications, there is a growing requirement for advanced methodologies that can push the limits of the conventional solutions relying on processing the signal magnitude spectrum. 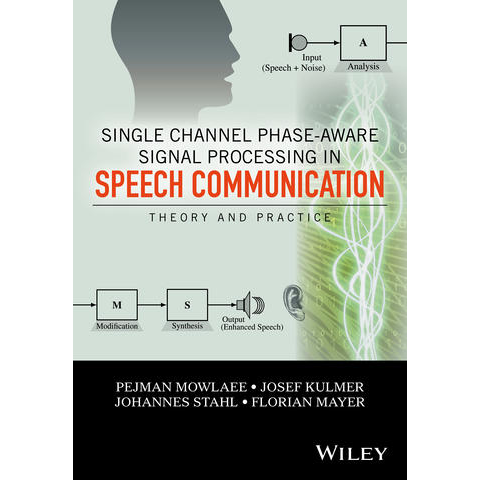 Single-Channel Phase-Aware Signal Processing in Speech Communication provides a comprehensive guide to phase signal processing and reviews the history of phase importance in the literature, basic problems in phase processing, fundamentals of phase estimation together with several applications to demonstrate the usefulness of phase processing. Analysis of recent advances demonstrating the positive impact of phase-based processing in pushing the limits of conventional methods. Provides a detailed review of many references and discusses the existing signal processing techniques required to deal with phase information in different applications involved with speech. The book supplies various examples and MATLAB® implementations delivered within the PhaseLab toolbox. Single-Channel Phase-Aware Signal Processing in Speech Communication is a valuable single-source for students, non-expert DSP engineers, academics and graduate students.